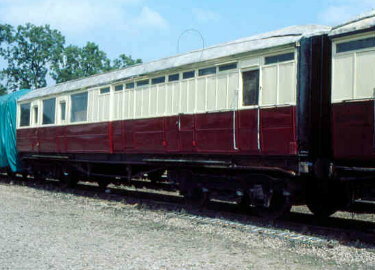 This is another unique survivor - the only short framed (52'6") Gresley brake vehicle in preservation. Built in 1927 at York, these shorter vehicles were mainly intended for use on secondary lines in East Anglia. It remained in service on these lines until 1959. Like many other Gresley vehicles it was then renumbered in the departmental series (DE320746). Its not clear what it was used for but the interior and underframe had been almost completely stripped by the time it was acquired for preservation in 1975. Moved to the GCR in 1981 it has been in store ever since. It is in the restoration queue, but unfortunately as we already have another brake vehicle it is right at the bottom of the queue. However, it was moved to Rothley in July 2003 and has been "adopted" by a member. Currently it is receiving attention to make it presentable, with the intention being to carry on restoration in the background with a return to varnished teak at some point in the future. The work being carried out on this vehicle is the subject of a diary on the Special feature page; in the recent past work on this vehicle has taken a back seat while the mark 1 TPO set is finished, but it is hoped work will resume in 2010.